First and foremost, the system is an effective tool for job seekers. 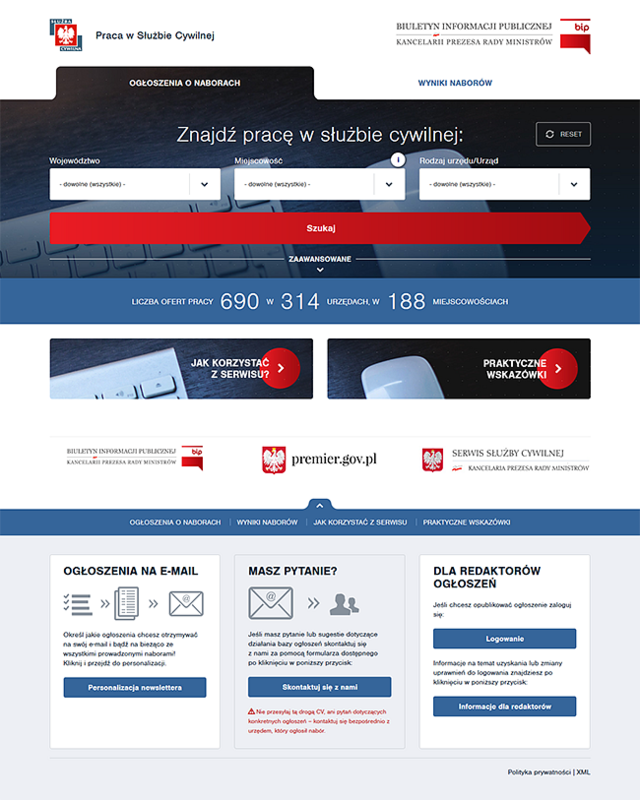 It makes it easy to search through offers from all over Poland and check each recruitment result added to the system. On the administration side it is used by more than 1500 editors who post advertisements of recruitment in their organizations. In order to find advertisements being of interest to the job seeker, the user uses the search engine on the service provider’s home page. All basic filtering mechanisms have been simplified to the maximum and, at the same time, they have been adapted to the special requirements for advertising in the public administration sector. The fields in the search engine filter each other dynamically – thus producing preliminary results in the first stage of the form. Using advanced options, the user can search the base by entering 12 variables. If there aren’t any interesting offers currently in the base, the users can sign up for a personalized newsletter generated on the basis of their preferences. The website has become very popular in the recent years – it generates more than 150 thousand unique hits every month, and that is without advertisements. Designing the system in terms of management and adding advertisements has been a major part of the project. Editors use it in their daily work publishing advertisements, entering recruitment results, generating reports. Adjusting editorial tools to legal regulations pertinent to recruitment processes in civil administration has also been a challenge. The system is in a permanent process of development, improvements and new mechanisms are being added so that finding a job with its help becomes easier and easier!